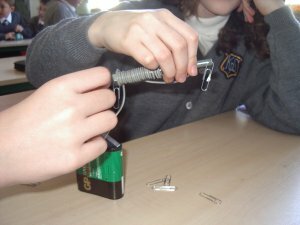 Experiment: To make an electro magnet. 1) Wrap the wire around over the whole bolt. Leave one piece of the wire free at each end of the bolt. So now you should have the end tip of both wires standing out from both sides. 2) Attach each of the loose ends to one of the battery terminals - one to the minus side, the other to the plus. Result: Light metal objects, such as paper clips, will now be attracted to the bolt. It has become magnetised! When the battery was disconnected, the paper clips fell off. Conclusion: The bolt becomes magnetic because when electrons run through the wire, a magnetic field is produced. If there is lots of wire coiled over itself, the magnetic field becomes stronger. Caution: The battery tends to become quite hot during this experiment (particularly at the terminals) - so take care! Don't leave the magnet connected to the battery for too long, because it will drain quite fast. This is quite a 'power hungry' experiment! 6. Hydrolysis II | 7. (The Nervous System) Finding your Blindspot | 8. (The Nervous System) One Point, or Two!